This date feels really important to me. Like a stepping stone…to something bigger. Awareness. My equilibrium is a tad off today, started last night actually. I am feeling a little out of balance. Maybe I am not “unbalanced” but what is happening is my balance is recalibrating. All summer I felt that October was going to be a big month. I feel like I am going through an attunement of sorts. I have been spending a lot of time in my head. As my clarity changes so does my perspective. I have talked so much about the chakras lately, but they are so important! I am personally finding it very hard to continue to live in duality. My esoteric body and mental body keep me in constant debates within myself. The more I struggle with this the more I realize that maybe that is the result of balance. Maybe…just maybe when you live 50/50 you remain slightly unattached to either side? Is balance what we should be seeking? If not balance what? Living on a line is hard. Seeing both sides causes one to not always react appropriately. Sometimes when you can see the end at the beginning do you forget to enjoy the middle? This is where I am right now, in contemplation. The other side of it is when you have lived shut off from the whole of all your emotions (you know, kept them tucked safely away for protection) when they start to surface do you recognize them? How does it feel to actually feel everything and not just what you allow in? How do you find balance of the emotions like you do of the mind? When the dam breaks and the emotions break free do you let them run where they may? If so are you washed away with them or do you create your own stream? My thoughts on this is when your ready to break down the dam, you need to be ready to trust the path that it settles into. 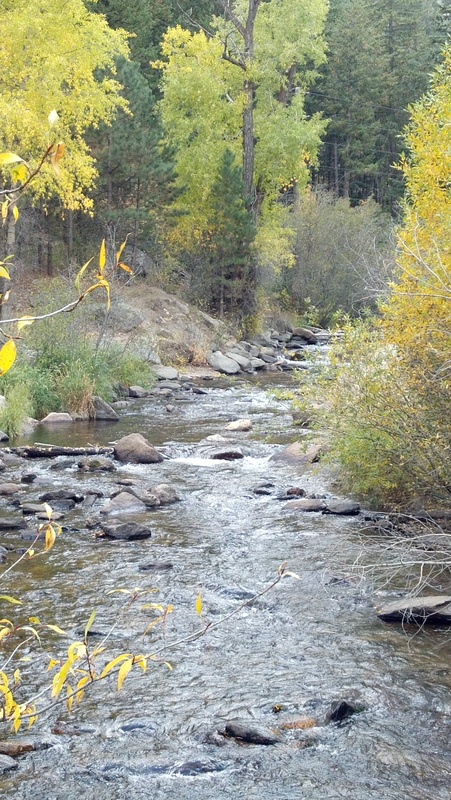 I am working on accepting the strength in the stream over the strength of the dam. They both are strong and mighty. One is just much more truer than the other. And in the end truth will endure any structure placed solely to contain emotion. My fear is what if breaking the dam breaks me. Just admitting that, typing it, lets my soul know that I am that much closer to creating my true stream. Even though just the thought of releasing that dam tightens my chest and brings to surface such internal fear it also makes my heart smile knowing and feeling the love and joy it also evokes. I am on my way. Word by word. Step by step, we all are. October is about contemplation, looking within and accepting and planning our new futures. I opened up my iPad to finish a blog I started only to find it was not there.. Again words lost. The thing is I did a reading with my new tarot cards shadowscapes. They are beautiful. Transfixing to look at. The reading was meant for me to share. It was titled the Journey. We are all on a journey of some kind. It is what propels us forward each and very moment in our life. This journey can feel so uneventful at times that we forget that we can forget the direction that we are going. It’s when we are awakened from this reverie that we can feel confused and disoriented. Unsure of what is actually happening. While others are in a constant state of change and challenge. Of course there are many levels in-between the two, which is where I think I fall. In my life journey the road has taken on many a different types of terrain. Nothing is always as picture perfect as we present it to be. The side message I am getting here is to keep in mind that you don’t always know what road a person is on in the course of their journey. Not everyone wears their emotions on their sleeve. Many that seem as if they do are really only showing you a piece of the intricate emotional layer that makes up our emotional body. I guess it simply goes back to the golden rule…do unto others (treat others) as you would have done unto you (as you would have them treat you). Now…this statement has gotten me into trouble many times. When I have actually debated the statement I was told that the problem with the world is we think that everyone is like us. This is not true, and by not finding out how a person wants to be treated we are being inconsiderate. Now that I am older and more experienced I would have won this debate with my original statement. The Golden rule is a simple rule of kindness. Not stating every interaction in life should be handled by only this simple rule…however; if we started every interaction this way wouldn’t we eliminate a lot of miscommunication, at least to start. I would argue that many would use this rule to actually cause conflict. You use it to inspire and encourage empathy, compassion, patience and understanding. Ok… Tangent over LOL! Back to my reason for blogging. This journey we are all on…this path we follow along in our life. Where does it leads us? There are times the path seems new, as if we are the only ones that have stepped upon it, other times we may find it worn and well traveled. We all come to the points of distinction such as; cross roads, road blocks, and ground that the path seemed so over grown that it was barely there. How many of us have actually come to that point in our journey that the only direction that seemed visible was the one we just came from? That is what this blog is about. The path that appears to not be there. To best demonstrate the intensity of this path, think of it like this. You are walking along your path and it gradually starts to change under your feet. The more you grow, and learn and feel empowered in your life you notice the ground below you has started to change. It feels strong and safe. Slowly this new path starts to turn into a bridge, you are rising above and obviously leaving things you no longer need behind you. As you climb higher you notice signs of others that have gone before you. You also notice that their foot prints have turned and at some point they have changed directions. Confident that you are reaching your purpose you continue on. Then, suddenly..the path ends. And you find yourself one step from falling from freest heights into a small body of water miles and miles below you. This is where this new tarot deck comes in. The image on the 3 of cups card pulled me deeply into this space, this place of choices. So many who come this far, turn back. Not because of the lack of drive, persistence, inability to see their goals. Caution is what stops us. Fear is what immobilizes us. The lack of Faith is what ultimately propels us to turn around. Our mental body is sometimes our worst enemy. For logically we look at the path and know that the footing is not there. If we take a step, we will plummet to our death. We will fall. We seek an alternative route. Convince ourself that to obtain our goal we need to look at the situation logically and find another way. This is great persistence! don’t get me wrong, and in the proper context it makes us highly successful people. But…we also risk stunting our growth, and never reaching our destination. It is in times like these that we have to remember that the one thing that can save us is…faith. 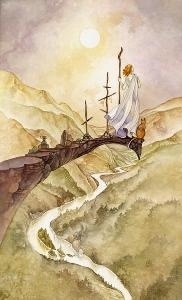 The story of this card is as this woman is standing at the edge of this bridge, she sees the other two swords left behind by the ones who did not proceed… And yet she is so confident in her direction, her journey that she takes a step. To find that the path below her appears. This is the time in our life, the point which is just for us, unchartered. It’s one of the harder tests, for we have to believe and have faith in that which we can not see. Our spirit body, mental body and emotional body need to trust one another and be balanced. A leap of faith. These leaps of faith are what not only propels us forward in our own journey of growth but it is what changes the world. I told a friend last week that Faith was my word of the week. I think I am changing it to my word in general. I know that the word Faith has caused arguments, even wars, faith is not about a specific religion. Faith is believing in yourself as well as a higher power. There is no contest as to whose faith is better, does that even make sense? I know I have a personal journey that I am on. I also know that mine is not bigger or more important than another’s. I do know that I have faith. And I trust that the path will form below each step I take, and that I am confidently headed in the right direction. Thank you for your inspiration and I wish you each one of you the faith you need to continue forward on your journey.